Congratulations to Ariana Lindquist, the photographer for Green Card Stories, who won the 1st place award in the NPPA: Best of Photojournalism 2012 in the Non-Traditional Photojournalism Publishing category with images from the book. Ariana was also a finalist for the International Photography Awards in the Deeper Perspective category. 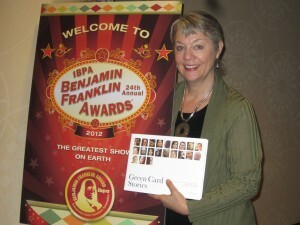 Green Card Stories received the Silver Medal for the 2012 Independent Book Publishers Association Benjamin Franklin Award in the Multicultural category. Green Card Stories was chosen as a 2012 Nautilus Book Award Silver Medal Winner in the Conscious Media/Journalism/Investigative Reporting category. 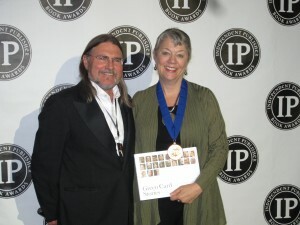 Green Card Stories received the Bronze Medal for the 2012 Independent Publisher IPPY Award in the Multicultural Non-Fiction Adult category. This explores immigration to the United States through fifty different portraits. The experience of each recent immigrant profiled here is told in an intimate but highly readable one-page biography that is accompanied by a beautiful full-page photograph. Subjects were carefully chosen to shed light on the complexity and diversity of immigration. Selections include stories of the poor, the middle class, and well-educated professionals, as well as those who have come from countries all over the world for economic opportunity or to escape oppression. With its focus on individuals, the book succeeds in humanizing the immigration issue. Congratulations to Saundra Amrhein, author of Green Card Stories, for being nominated as a finalist on the short list for the 2011 Santa Fe Writers Project Literary Awards for her work on the book. Out of an initial 750 applicants, the pool was narrowed down to a long list of 53 finalists and then 23 were selected for the short list.